My heart is full of thanks for all the wonderful messages that have been left for me.......you are among the sweetest people on the planet.......thank you! Today, I wanted to make something that would make me happy.....so I made a Christmas card........predictable?.....oh, yeah! 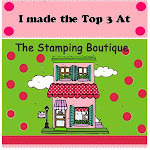 And what else makes me happy when I'm makin' a card?......using freebies!.......yaaaay! Oh, I did enjoy makin' this one! 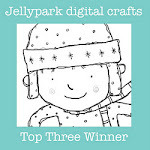 Don't forget to keep a look-out for a super giveaway.......I've got so much to celebrate! OK, now just how cute is this card?? Wowzer at all the freebies -- you were on a roll there -- lucky girl! Everything is adorable. Top notch. Awww this is so gorgeous Anne-Marie. I love the colour scheme, I think Kraft and red always work so well together especially for Christmas cards. Your attention to detail is wonderful. like ur cards... u r gorgeous! Such gorgeous muted colours and love the matting, Anne-Marie! Cute card; love that little reindeer and that ribbon - GAH - love! Thanks for joining us at Ladybug Crafts Ink challenge!! Free is wonderful!!! And so is your card!! Great little details!! Hi Anne-Marie, such a sweet card - and with all those freebies a very economical one too!!! Was reading back on your previous post and see you have the all clear from the Big C - congratulations!! You must be very relieved and happy. Best wishes for a very happy weekend (a bit early I know with it only being Thurs - but I bet you feel as happy as if it were Fri!!). Beautiful card - love the kraft effect - just brilliant. Cute card, Anne-Marie! Love that sweatery ribbon you used! Thanks for joining us at Christmas Card Challenges! This is cute, Anne-Marie! Adorable images. 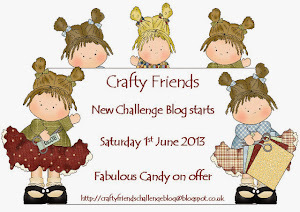 Thanks for playing with us at Crafter's Cafe Challenge Blog. This is super adorable! Awesome use of kraft! Thanks for playing along at CCC! Such a cute reindeer. The layout and colours are gorgeous. Thanks for joining us at LCI Challenge this fortnight. 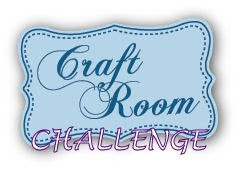 Thanks for joining us at The Crafter's Cafe Challenge Blog. Wonderful card! Love the little red-nosed reindeer!! Anne-Marie, sweet card! That reindeer is so cute! What a cute card. Thanks for playing at CCCB.